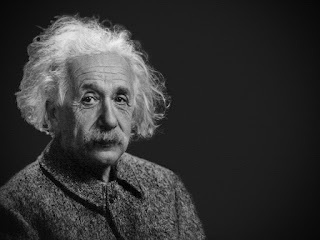 This is similar to his assertion that the difference between genius and stupidity is that genius has its limits, and one can see that a life lived through the first half of the 20th century, when the world tried twice to tear itself apart through war, would naturally tend to this point of view. Einstein described himself as a “militant pacifist” who would fight for peace, and would no doubt have agreed 100% with his near-contemporary and fellow pacifist Bertrand Russell who said that “War does not determine who is right, only who is left”. What could be more stupid than behaviour that costs so much and produces so little? However, Einstein might also have been influenced by his great predecessor Isaac Newton, whose theories inspired his own re-interpretation of them. Newton once wrote: “I can calculate the motion of heavenly bodies but not the madness of people.” Those two great minds clearly both recognized that science had its limits, and working out what their fellow humans would do with the discoveries made by scientists was clearly one of those limits. Those who seek to deny what science says now about climate change and man-made global warming would surely be on the “stupid” list of both Newton and Einstein were they alive today. My desk is always cluttered! That is because I like to have everything I need close at hand and not have to be constantly getting up and either fetching things or putting them away. Librarians are supposed – in theory – to be tidy people who always know where everything is, but tidiness has never been my number one priority! I once worked for a company in which a decree went around from “upstairs” that nobody was allowed to have more than two pieces of paper on their desk at any one time. Needless to say, I took absolutely no notice of this edict! Nothing came of it – possibly because the manager who issued this command was too empty-minded to ever think of visiting the library! It was good to know that – should I have ever been challenged to defend my desk clutter – I would have had Albert Einstein on my side! Again – it’s good to know that one’s efforts have the support of one of the greatest minds ever to have existed! The company I mentioned above did not agree with this sentiment towards the end of my time with them. It was a major UK player in the telecommunications industry, with offices and factories in towns and cities throughout the country. I was the chief librarian, with responsibility for coordinating the company’s four libraries (in Coventry, Liverpool, Poole and Nottingham). As time went by, each library was closed in turn, and the staff made redundant, leaving me with just the Coventry library from which to serve the needs of a 50,000 strong workforce with just one library assistant as my support staff. The fact that this was plainly impossible was all that management needed to declare that the job did not need to be done at all, so the final library was closed as well. The whole company went to the wall six months later. The thinking was that libraries were not necessary because “it’s all on the Internet”. Somebody once said that the Internet was the world’s largest library, in which all the books had been thrown on the floor. In other words, in order to get the best value from the undoubted benefits that the Internet can provide, you need somebody who can help you to find what you need, and what you can trust, in the shortest possible time. Can I suggest that a professional fully-trained librarian might be just that person? Libraries have moved on since Einstein’s time, but the principle enshrined in the above quotation still applies. Perhaps it needs a slight rewording – the only thing you absolutely have to know is who you can call upon to help you when you come to a grinding halt in your search for information!